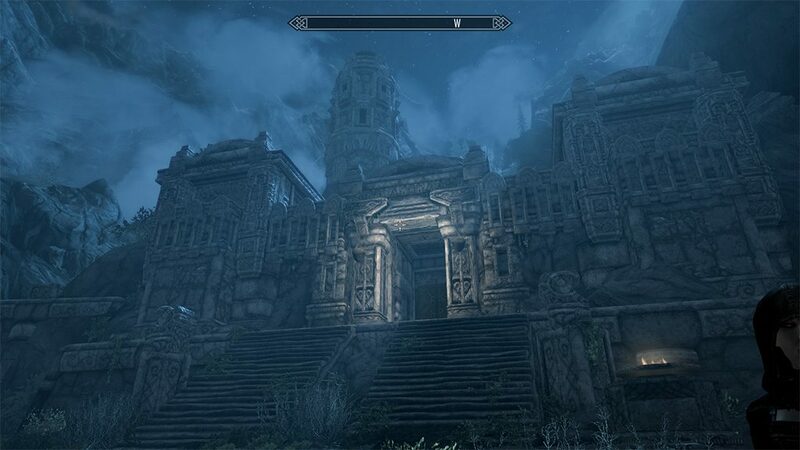 “The Elder Scrolls V: Skyrim” (video game) seems to be the perfect case study that illustrates the ways in which designers of virtual worlds create sublime aesthetic effects. As shown in the 4th article in this series, the aim of ‘alternate history’ designers is to create an environment characterised by otherness, evoking a different space-time. The chosen mythical world is the Western pre-Christian early Middle Ages, as described in Germanic legends such as “Beowulf”, “Volsunga Saga” and the Norse Eddas, filtered through J.R.R. Tolkien’s fantasy fiction. If the ancient epics and sagas already projected their mythical approach on the past, Tolkien went to a totally new level when he invented an entirely fictional Universe, ‘the Middle Earth legendarium’, together with fictional geographical maps, languages and kings’ chronicles. Bethesda Game Studio continued Tolkien’s project through revisiting his legendarium coupled with a fresh reading of ancient texts, no doubt through the interpretative lens of contemporary ethnologists and historians of religion like Joseph Campbell, Claude Lévi-Strauss, Mircea Eliade. In the end, Bethesda created a completely new legendarium – the fictional continent of Tamriel located on planet Nirn. The vast detailed chronicles of Tamriel were recorded in an archive known as the Lore, which constituted the basis of all video games in the Elder Scrolls series, including Skyrim. An unnofficial fan-made reconstruction of the Lore is available online. 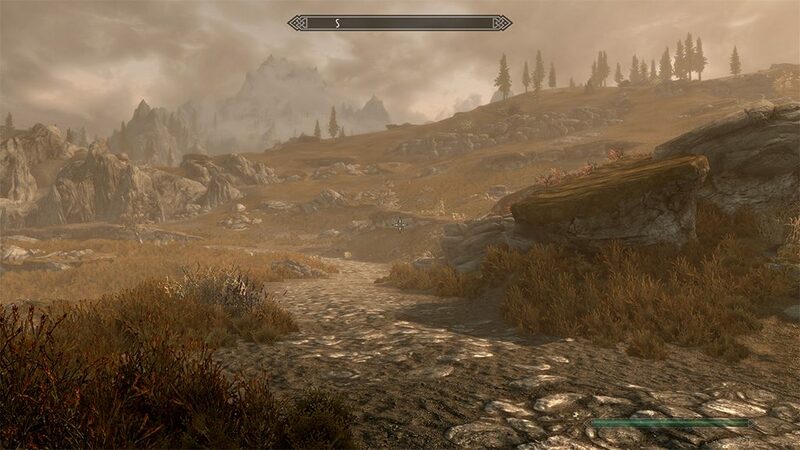 While playing Skyrim, the first way of experiencing the sublime is related to the breathtaking natural landscapes, drawing inspiration from Scandinavian and Icelandic landscapes, which presented the necessary degree of otherness. You are removed from your familiar space-time and become immersed in a picturesque natural world with huge mountains, cascades, valleys and caves. Areas of tundra alternate with cold regions covered in snow, icebergs and glaciers; the relief map is designed to keep the player in a continuous state of awe through various scenographic effects such as magnitude, ascending/descending views, panoramas, picturesque vistas, immediate contrast between different effects. The sublime varies from ‘the splendid’ to the ‘terrifying’, in Kant’s terms, or from the weakest feeling of sublime (‘light reflected off stones’) to weaker feeling of sublime (dark and deserted Northern landscapes with icebergs and glaciers, forgotten glacial caves) in Schopenhauer’s terms. The visual immersion and the level of realism were completely unprecedented at the date of the game’s release (2011) and constituted a long-lasting source of fascination for millions of gamers. Although many critics pointed out that the level of immersion could have easily been improved by making the playable character vulnerable to weather conditions, or by increasing the physical distances so the environment does not feel like a theme park, everyone has been ambivalent toward the game’s achievements and its unique and coherent visual style. The main person behind this was Adam Adamowicz, the game’s concept artist who designed pretty much everything from natural landscapes to cities, artifacts and characters. The dwellings scattered across the landscape instil other types of sublime through various effects. 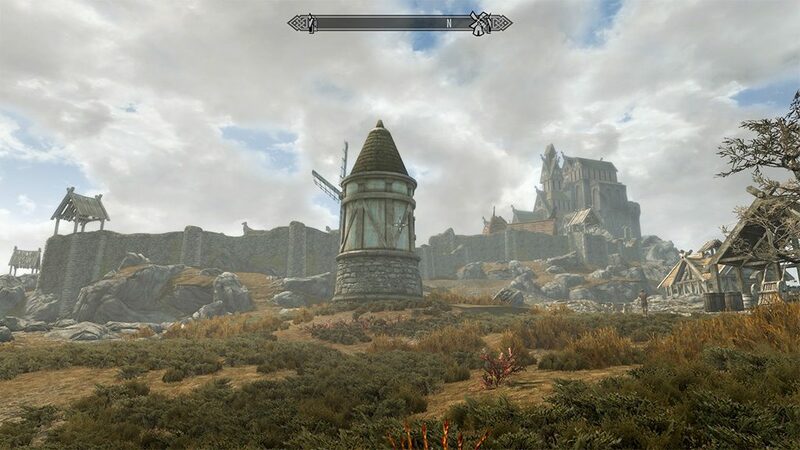 In terms of scenography, the villages and citadels feature the same effects used for the natural landscapes – magnitude (Solitude), picturesque (Windhelm), contrast (Markarth), ascending or descending views. The dwellings appear as deja vu images from early European settlements or their fantastic depictions in popular culture. Their building style and composition reinterprets Old Norse, Anglo-Saxon, Celtic or Norman architecture, bringing the pre-Christian age back to life replete with temples, villages and fortified citadels. 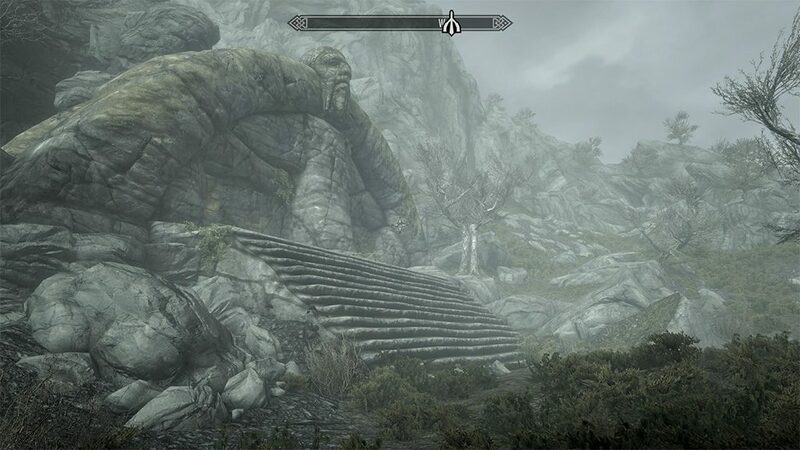 As in other works of fantasy fiction, the peoples found in Skyrim are reminiscent of historical civilisations; the declining Cyrodilic Empire who used to control the entire continent has clear references to ancient Rome and the Byzantine Empire. High Rock is the Western home of the Bretons, a people of mixed human and Elvish heritage, borrowing their identity from Medieval Britain and its mix of Celtic, Anglo-Saxon and French-Norman influences. Skyrim is the home of the Nords, the equivalent of the ancient dwellers of Scandinavia. The old inhabitants of the Reach, an area situated between the border of Skyrim and High Rock, are the Forsworn, an old Breton people that worships the old gods instead of the Tamrielic Pantheon of the nine divines. Many references to Welsh, Pictish and Irish inhabitants of the British isles. To the East of Skyrim lies Morrowind, the land of the Dark Elves, who borrow heavily from Chinese and Indian myths and cultures. The design of Skyrim’s dwellings features picturesque fortified castles on hills, dense houses scattered inside the citadels, giving a sense of organic development and historical depth. Everything, from the interior of inns to temples and palaces, is consistent with the technologies of the evoked period. The designers also added a mythical Celtic/Germanic layer, in order to enhance the otherness of the virtual world: the people of Tamriel worshiped pagan deities, the 9 divines, who often mingled in human affairs. The Daedra were another class of mischievous supernatural tricksters that are a significant part of the game experience, appearing before the hero in unexpected circumstances and demanding their allegiance. The races of the continent’s inhabitants also reflect the Germanic Universe: humans, elves, orcs, dwarves, goblins etc. Mythological themes such as killing the beast, the World Eater, the trickster deity, the quest for the holy artefact, the land of the dead ancestors, the descent into Hel, the nine realms of the world, the world-tree, are integrated in the game’s stories. The mythic layer is also emphasized through Stonehenge-like ancient altars, burial grounds and ruined cities scattered throughout the landscape, whose purpose was long forgotten. Tolkien’s influence and its visual materialization through Alan Lee’s paintings or the ‘Lord of the Rings’ CGI has become a tradition in itself, carefully integrated by Skyrim’s concept artist, Adam Adamowicz. Thus, the city of Whiterun in Skyrim evokes Edoras in LotR; Markarth evokes Minas Tirith, the underground burial tombs evoke the depths of Moria and the Paths of the Dead; the Elvish, Dwemer and Orcish armors are obviously borrowed from the LotR trilogy etc. The historical sublime is also present through the integration of ‘alternate worlds’ in the Tamriel’s legendarium. The long extinct Dwarves (‘dwemer’) were an ancient, technologically advanced civilisation that built complex underground cities and galleries. They used steam-powered machinery, built defensive automatons and dragged natural light through mirrors and pipes deep into their underground cities. Here Adam Adamowicz was clearly inspired by the Retrofuturist Steampunk subculture (the 1900’s steam technology re-imagined as futuristic). However, in order to give it an ancient mythic flavour compatible with the Elder Scrolls, he mixed it with Mayan architecture and decorations – the cities of the dwarves are carved in stone, probably evoking the ancient city of Petra as well. 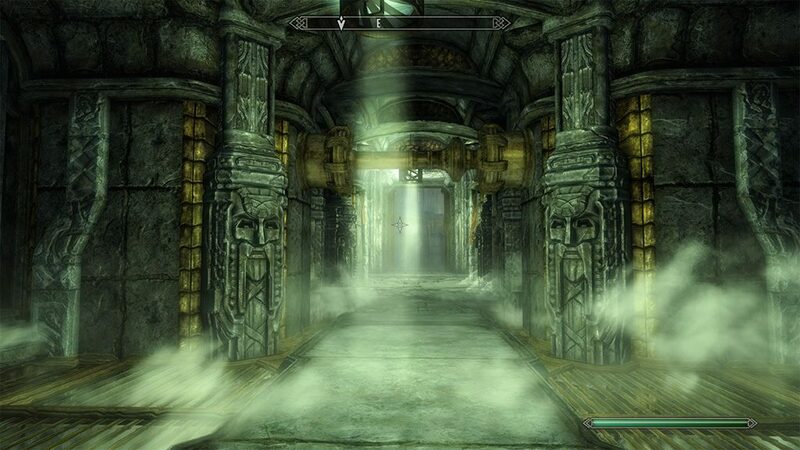 The complexity of these ruins, along with their gigantic scale, age and mystery (no one knew the reason of the dwemer’s disappearance, their ruins were still full of functioning artefacts, dangerous traps and automatons) evokes a feeling of historical sublime. The Gothic subculture is also introduced in the world of Tamriel through the ‘Dawnguard’ campaign; there are immortal vampires in Skyrim, living in dark Gothic Revival palaces, feeding on human cattle. H. P. Lovecraft’s world is also present through the ‘Dragonborn’ campaign as Apocrypha, the realm of Hermaeus Mora, the Daedric Prince of knowledge and memory. Represented as a chaotic deity full of eyes and tentacles, it is a clear reference to Lovecraftian old gods like Yog Sototh, Nyarlathotep or his monstrous shoggoths. All these mixed virtual realms, each with their own richness of meanings, accentuate the feeling of otherness, visual and symbolic complexity and grandeur. There are even books in Skyrim which the player can choose to read. This is the only way in which fans have been able to reconstruct the game’s Lore. However, even the books present incompatible views and assumptions about the history of Tamriel; there are wide disagreements between various scholars, competing religions and ideologies, all contributing to the sense of historical depth. The soundtracks become strongly associated with the various types of landscapes and experiences in the game, contributing to the overall effect. Jeremy Soule composed the soundtrack for Oblivion and Skyrim after a near-death experience, in which he lost control of his car and for a few seconds though he would die. During those moments he realised he was content and though that he had had a great life. “When he emerged from the accident with mere cuts and bruises, he poured the beauty of life into the music for Oblivion, hardly feeling the need to revise any of his first attempts” – danielran.com, ‘The Elder Scroll Retrospective’. 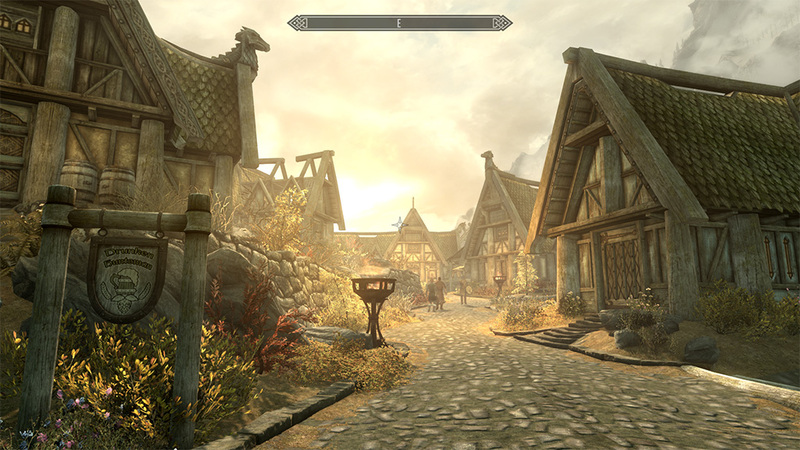 luvondarox: I haven’t a clue why, but for some reason the Streets of Whiterun is one of those incredibly rare works of art that (somehow and against my will) moves me to tears. I don’t know why. I adore this piece, and as others have mentioned I will occasionally travel to Whiterun just to hear it. (It does help that Whiterun is my favorite Hold in Skyrim, but I digress.) There’s a strange kind of power behind this song, and it always conjures feelings of hope, nostalgia, loss, family and… home. Like looking on the light-hearted Christmases long ago or something, and remembering the days when my family was together and happy. It’s a good feeling. I wish I could find the words to describe it. It’s not a song that stagnates: it has no set “theme,” but instead seems to amplify whatever I’m feeling at the time. It’s uplifting, it’s tragic, it’s community and families and the sun peaking over freshly fallen snow while you’re holding a mug of something hot and delicious, and two moons hanging heavily over tundra and farmland, making sure the nights never get too dark. It’s beautiful. Ironrune: To see so many people moved by this one song. We all entered those gates to Whiterun alone. We ran for our lives after being ready to die at a chopping block. We avoided Alduin’s ancient fire, his terrible words. We made it out alive with enough time to warn the world of the impending doom. We made it into Whiterun with all the excitement Skyrim had for us. We entered alone. But I dare say, as the love and emotion for this song shows, we did not leave Whiterun alone. Aye, I’d say after Whiterun, none of us will ever be truly alone again. Kyrie Luka: just have to say, this song makes me feel a sense of calmness like something is telling me “it’s ok, you don’t have to worry anymore” in a morbid way of looking at it i wonder if this is how dying feels. a sense of calm and comfort letting your worries go. i only thought of this because i remember reading up that when you’re right about to die you don’t feel any pain. it’s such a beautiful song. sorry for the morbid thought. Nevak Nevak: isn’t “dying in life” what spiritual illumination is all about anyway? Tired Hawk: This reminds me of home in Ireland. Randall Schoverling: This is what it’s like walking in the woods of New England. Llamonade: You are my hero!… or possibly my therapist… I haven’t quite figured out which yet. Firjii The Novel Composer: About 40% of my time in Skyrim is spent on looking for spots where I can safely stare at the landscapes and/or listen to the rain. Quests? We don’t need no stinkin’ quests! jillian keserich: I listen to this every night. This and The Streets of Whiterun. It is slowly helping me get over my dogs death. She died on May 9th, 2017 because of heart failure. I had her my whole entire since I was little, and she just poofed from my life. I miss her dearly, and can’t wait to see her once again in heaven. Neon Unicorns: Dude, I want to be in a forest of Tamriel right now. It feels as if it’s a place that exists that I cannot touch, but where a piece of my heart resides without me. That Hoser: The emotion in this piece is one of my most favored feelings. Also, I think this is my favorite scene so far. I like that there is no sunlight glistening on the water as is most common in pictures like this one. To me the darker scene here lends well to the feeling from the music. I live near to scenery such as this, but farther than I’d like. Visiting places like this made a strong impression on me growing up – My ‘mantra’ as a child was “Rocks, trees, and fruit – all I need in my life.” Thankfully God has provided these to me in abundance all my years – but I still can’t get enough. Thanks for the great work and bringing back many great memories. … Can stare at this for days listening to this…. I myself became so fond of Jeremy Soule’s music over the time that I managed to recognise each song in Morrowind, Oblivion, Skyrim and Elder Scrolls Online, then took the time to label each of the tracks in a 12 hour youtube video. After experiencing the virtual realm of Tamriel, ‘Skyrim’ remains recorded as a vivid memory, a journey into otherness. After a few years, you might even become nostalgic of that realm, as many players confess. Therefore, I believe the game is one of the best examples of legendariums, offering a vast array of complex feelings of sublime.